Negev town continues to spiral out of control after death of two residents during police activity; video shows officers saved from Arab mob. In the Bedouin town of Rahat, located in the Negev, a protest procession held Tuesday night for two residents killed during police activity in recent days spiralled out of control, as an explosive was hurled at police forces trying to disperse hundreds of Arab rioters adjacent to the town's police station. The rioters launched a fusillade of rocks and Molotov cocktails targeting the officers in addition to the explosive. Four minors were arrested on suspicion of throwing rocks; one of them was wounded by the rocks they were throwing and required medical aid, after which he was brought in for investigation as well. The rioting followed a protest over the deaths of Sami al-Jaar, a resident of the town who was shot last week during a police drug raid, and Sami al-Zayadna (47), who died of a heart attack on Sunday as officers tried to use tear gas to fend off a violent Arab riot following al-Jaar's funeral. Police Chief Yohanan Danino had arrived at the station in Rahat earlier Tuesday where he was given a tour by the regional chief Yoram Halevi of the preparations by police forces in the unstable region. He called on Bedouin leaders to urge their communities to show restraint. Danino said "I understand the pain of the families and join in their sorrow, but we all have a shared responsibility to maintain the achievements we've reached together with the Bedouin population with hard work." "The Israel police won't allow breaching of the law and will act firmly against all those trying to do so, we won't allow the harming of our officers or any citizen of the state of Israel," stressed Danino. 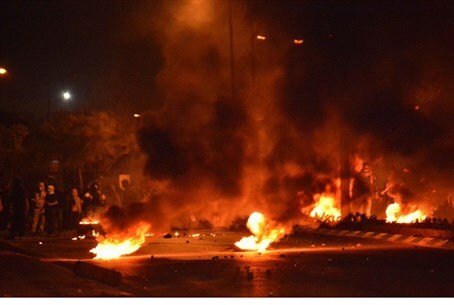 Video published by the police on Tuesday night shows the events on Sunday when al-Zayadna died. That night a police car drove on the road where the funeral of al-Jaar was conducted, until numerous cars blocked it off from all directions. A raging mass of hundreds of Arab rioters set upon the car and threw rocks at the officers inside, as they tried to escape from the blocked off area of the road. The officers exercised restraint by waiting for back up despite the danger to their lives, and shortly thereafter the rescue force arrived and started firing flares and tear gas to prevent the likely murder of the officers, as can be seen in the video which starts as the back-up police car pulls up. "During all the days of the year we work continuously with the authorities and residents of the region," said the commander of the southern district Yoram Halevi. "It is clear to us that the majority in Rahat is moderate and wants police services, but there are those who incite and call to harm officers, and we won't let that pass." Halevi added "we will continue communication so that these incidents end quietly. In parallel, using intelligence means, we will act against those trying to harm officers and prevent them from fulfilling their duties." In response to the deaths of the two Bedouin men, leaders of the 1.7 million Arab citizens of Israel called a general strike on Monday, with Arab university students staging protests on Tel Aviv University campus and campuses in Haifa.